As you've undoubtedly heard by now, the FCC did what everybody expected them to do today and repealed net neutrality. If this stands, we will likely end up paying our ISPs more for less. I don't know about you, but I think we already pay far too much for abysmal service. But what really worries me about this is the possibility that it will end the level playing field we've been enjoying on the Internet. Under net neutrality, the "little guy" with a website has been able to compete with the "big guys," at least in terms of things like access and speed. As a "little guy" with a website, I'd like this to continue. And for anyone who belongs to a marginalized group (e.g., atheists), I think this is especially important. Just think about how much the open Internet has helped us to learn about atheism and connect with other atheists. It is difficult to imagine where we'd be today without it. 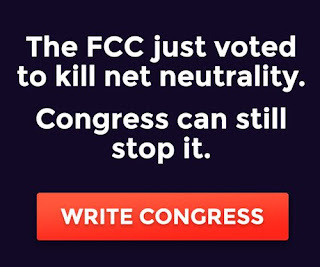 I don't think our chances of saving net neutrality are very good, but I'm sure as hell going to do my part to try.